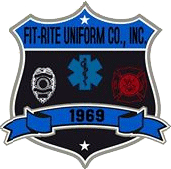 Fit-Rite Uniform Co. was founded in 1969 by a volunteer EMT. The same family still runs the business today, serving police, fire, EMS and security professionals across the country. Fit-Rite has become well known for its large line of stock and custom pins and emblems many of which we manufacture. Download our catalog for a sample of our merchandise. If you don't see it, we can likely find it or create it. Originally based in Hillside, New Jersey, Fit-Rite recently moved to a new building in nearby Union Township. Fit-Rite is proud to be a Better Business Bureau accredited business with an A+ rating.